Fun for a casual get-together - even in a college dorm. 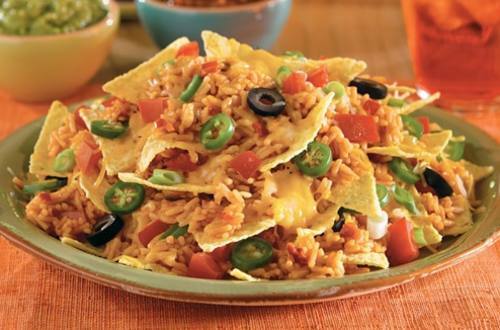 1 Layer tortilla chips, hot Knorr® Fiesta Sides™ - Spanish Rice and cheese on microwave-safe platter. Microwave on HIGH until cheese is melted, about 2 minutes. Serve, if desired, with your favorite nacho toppings such as sour cream, guacamole, sliced chili peppers and salsa.